Inter-island ferry service from Put-In-Bay gives visitors a chance to visit other Lake Erie Island. Hop over to Middle Bass Island and discover the remains of the fabled Lonz Winery. Be awestruck by the Glacial Grooves on Kelleys Island. With so much to do in the region, one day isn’t enough! The Jet Express Passenger Ferry offers a wide range of choices for passengers. First, their mainland port choices include Port Clinton and Sandusky Ohio. On island port options are Put-In-Bay and Kelleys Island. So, guests can choose to purchase an island hopper ticket. 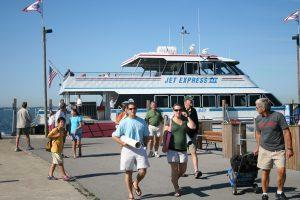 With this fare, passengers can head to Put-In-Bay or Kelleys with the ticket. Then, they can hop back aboard the Jet Express and head to the other island. This is an excellent way to see the most during a trip to the Lake Erie Islands. Kelleys Island is teeming with great fun and activities for all ages. First, the glacial grooves park gives an insight into island life long ago. There are also many great restaurants and bars, and also a winery. Most notably is the Pump. Step inside and order their famous Brandy Alexander, by the glass or pitcher. Be sure to get your high five from Gary! 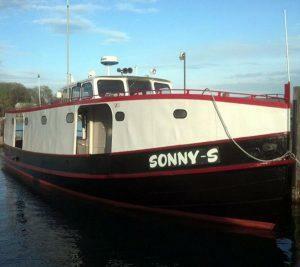 Departing from their downtown Put-In-Bay dock near the Boardwalk Restaurant, the Sonny S offers transport to Middle Bass Island. The leisurely jaunt across Lake Erie will send you to a beautiful island with an exceptional natural setting. Along the way, passengers can take in views of Perry Monument and Gibraltar Island. Once on Middle Bass, passengers can explore the grounds of the Lonz Winery. Currently, the property is owned by the State of Ohio and has been converted into a park. Also, a large marina is onsite. Two local restaurants serve up hot food and cold drinks for travelers. Be sure to check out the great atmosphere at St. Hazards. When visiting and staying on Put-In-Bay, options abound for island hopping. Other great islands are very accessible and ready for rowdy revelers. Be sure to research all of the great places that are available. For Hotel and Vacation Home Information, refer to the Lodging Page.